Once a year AVIXA throws it’s biggest stand-alone event; InfoComm. This year audiovisual professionals are headed to Las Vegas June 6 – 8 to see what ProAV gear will be unveiled at the Las Vegas Convention Center. AVNation will be there alongside them to bring you the latest news, products, software, and innovations from the InfoComm 2018 show floor. 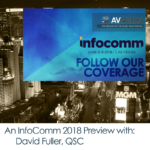 Our coverage begins May 1 with our InfoComm 2018 previews. Our coverage of InfoComm 2018 is made possible by our great group of underwriters. To find out more about AVNation TV underwriting click here. Vitec rolls out new video wall management and content delivery features for their renowned EZ TV product. RTI, Remote Technologeis Inc continues to grow into light and large-scale commercial solutions. With an established background of residential solutions, RTI has grown with its client into remote management and more. Logitech continues to expand into conference technologies with products aimed at small to medium-sized collaboration and conference rooms. Lyntec is a manufacturer of circuit-level power control for professional AVL systems. Specialized Outdoor TV’s Provide a substantial ROI while providing advertising and information in aesthetics necessary for Hotels, Sports Bars, Malls and Sporting Venue Retail. Panasonic focuses on immersive events, bringing participants into the show, engaging with education materials. 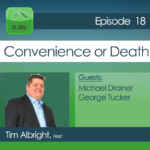 D&B are advocates for an open source implementation of AVB and TSN transport application. Henning Kalheuner explains the standards and why Milan will set the path forward. Infocus continues to innovate with solid state projection across model lines. Meeting collaboration via Simple Share expanded, no additional software needed. Why I’m Proud to Be a Women in AV! Women in AV founder, Jennifer Willard, gives her thoughts on the progress of diversity and inclusion at the annual InfoComm trade show. Just Add Power continues to advance its HDMI over IP products including a free Plug Play Present tool for its products. AVAD brought its passion for clients and collaboration to Infocomm 18. Audinate now offers legacy adapters to bring older analog gear into the networked systems and previews a partnership with SDVoE. Iminate offers a line of price conscience wifi based control systems offering keypads, lighting control and security sensors. 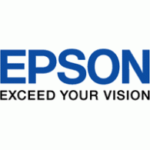 Ricoh has refocused on the end user, looking to make set up and user easier. From live streaming technical support to workspace whiteboards. Leon acquired the American made outdoor speaker company Terra in April, the merger brings the offer of both indoor and outdoor solutions. The new Axis Pro 70 volt commercial speaker line debuts. Power is the essential foundation of any system, Torus provides new products for large-scale and small room projects. The video over IP solution alliance celebrates one year and 40 members, including a working model of Dante collaboration. New Projector and Large Display Mounts allow integrators to transform spaces. Tesira line of AV servers and digital processing now has browser-based management and monitoring platform. HDBaseT grows into an over IP solution while keeping point to point products in the fold, expansion into test equipment and switches. Draper has a little-known custom solutions division which creates unique and specialized products to fit installation needs. The Digital Media line expands into solutions for smaller projects and additional management tools. Ambient light is the bain of projection systems, ISF certified screens minimize the effect of providing sharper images. Velocity and Omnistream AV over IP adds Zoom interoperability, more tools for reliability. Finding competent ProAV workers and connecting them with integrators needing help with TierPM. Matrox talks about Open Source SRT that allows audiovisual signals to pass along noisy networks without issue. New Kramer US CEO Clint Hoffman talks audiovisual networking and evolving Kramer control for ProAV dealers. At InfoComm 2018 ClearOne introduces COLLABORATE Space that allows ProAV dealers to use tools like screen and document sharing, whiteboarding, and recording. Vanco will be bringing their video over IP solution to InfoComm 2018. They will also be showing infrastructure and Beale Street speakers. Remote management solutions for audiovisual integrators, simplified control programming, and new corporate music for the ProAV market. Automagically adjusting projection blending, AV over IP, content takeovers, and powerful tools for powerful experiences audiovisual dealers can deploy. Wireless charging of up to 9 devices at a time, ProAV infrastructure, and making furniture audiovisual functional. Giving audiovisual integrators access to ProAV techs around the world and a simple interface to post jobs and find freelance talent. The crowd mic category is getting interesting with the addition of an American Football shaped microphone from Big Purple. WyreStorm is bringing three technology solutions so ProAV integrators can send audiovisual signals down the network; SDVoE, JPEG2000, and HDBaseT. CloviTek promises discreet listening of an audiovisual signal through the Wi-Fi for up to 10 people on a mobile device. The Samsung company looks to ways their myriad of products can help in education, corporate AV, huddle rooms, and other audiovisual spaces. 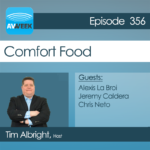 Video over IP solutions, infrastructure, and ProAV voice enabled control and automation at the annual audiovisual show InfoComm 2018. Luxul continues their expansion into ProAV with unique AV IT switches and IT education for the audiovisual dealer. Sending audiovisual signals over the network for the past 10 years, Just Add Power lets ProAV dealers now shoot HD-SDI down their network. Peerless-AV will show both the mounting and audiovisual technology capabilities they can deliver to ProAV integrators at InfoComm 2018. LynTec power provides audiovisual integrators the ability to control power distribution with multiple control protocols. Crestron looks to expand their technology from enterprise and education to the network at InfoComm 2018. Exterity will show ProAV dealers how to incorporate 4K distribution across a digital signage network at the audiovisual tradeshow InfoComm 2018. Audiovisual integrators can get a technology roadmap with Emerging Trends or learn how ProAV and HomeAV intersect with Integrated Life ahead of InfoComm 2018. Video wall software using video over IP technology from VITEC at InfoComm 2018. KanexPro is known for their infrastructure. At InfoComm 2018 they will also be bringing a new audiovisual control system in addition to video over IP. Iminate is a new control and automation platform that also interfaces with other audiovisual control systems to allow you to control and monitor lighting and power consumption. AVIXA has created a three day free education session for ProAV attendees to InfoComm 2018 called Center Stage. Middle Atlantic is combining with the newly acquired Milestone AV brands at InfoComm 2018. Bringing over 100 hours of training for the audiovisual community. AVAD comes to the InfoComm 2018 show to connect with ProAV dealers and show off how they can help them succeed. InfoComm 2018 releases their list of speakers for their second Center Stage, presentations throughout the annual audiovisual trade show. Da-Lite continues development of ALR, higher resolution screens ahead of InfoComm’s audiovisual trade show. Vaddio shows several cameras for different ProAV applications ahead of InfoComm 2018. Barco is bringing UniSee, ClickShare, Overture, projection and more to the biggest audiovisual ProAV show in North America; InfoComm 2018. Draper is bringing more ALR, video wall mounts, and control systems from Evoko to InfoComm 2018. RTI returns to the biggest audiovisual trade show in America, InfoComm, to support their dealers, show off new control and distribution options. Previewing the opportunities for education and connection for ProAV integrators at InfoComm 2018. AV Stumpfl USA will now be known as AV Franklin. 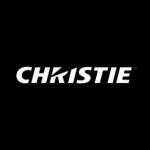 The U.S. company looks to broaden their product line to support live staging audiovisual production customers. Chief integrates with the rest of Legrand for the audiovisual show InfoComm 2018. Atlona is bringing both the Atlona Management System (AMS) and OmniStream AV over IP to the ProAV show InfoComm 2018. Barco is leveraging the strength of ClickShare, excitement over UniSee to enhance enterprise audiovisual markets and help ProAV integrators deliver exceptional experiences. More than 18,000 end-users were reported being at Infocomm 2018. What this means for integrators at trade shows. Are there too many end users at InfoComm? The importance of seeing live demonstrations at trade shows. Josh Srago talks about his experience and discourse at the Interoperability panel at InfoComm 2018. 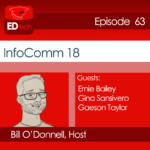 Dawn Meade shares her experience as an end-user at InfoComm 2018. Emile Van De Coevering shares his experience at InfoComm 2018. David Labuskes discusses his most treasured moment of InfoComm 2018. Wrapping up InfoComm 2018 with a tech manager’s perspective. Sony audio, Samsung The Wall, and tap shoe microphones. Is Amazon a ProAV dealers competitor? Too many end users at the InfoComm show. Using mobile devices for audiovisual control interfaces. Wrapping up InfoComm 2018, the ProAV industry’s biggest North American show. We talk end-users experience, audiovisual manufacturers expectations, and a look ahead to the future. Wrapping up the week of InfoComm 2018 talking experiences, integrated life, and data analytics in ProAV. Amazon Echo’s recording risk may threaten voice control in ProAV. Legrand launches commercial audiovisual group. Making the most of InfoComm 2018. Reasons why ProAV dealers should stop using consumer routers and switches. The battle between backward compatibility and security. What IT managers need to know about sending audiovisual signals across the network. Connecting with audiovisual consultants. Peering into the future of ProAV at InfoComm 2018. Translating conference calls in real time. The education opportunities at InfoComm 2018. The importance of events like Crestron’s Masters to the audiovisual industry. Expanding diversity in ProAV. A new standard for hearing assistance for ProAV dealers to install. Dante support for AES67. InfoComm 2018 will show how AR and VR can integrate into an audiovisual system.